As shown in the main elaboration, pairs of electrons in an atom emit pairs of energy quanta, which immediately form a complex quantum connected with the magnetic poles (see the figure below). Each complex quantum is a precursor of an electron-positron pair. 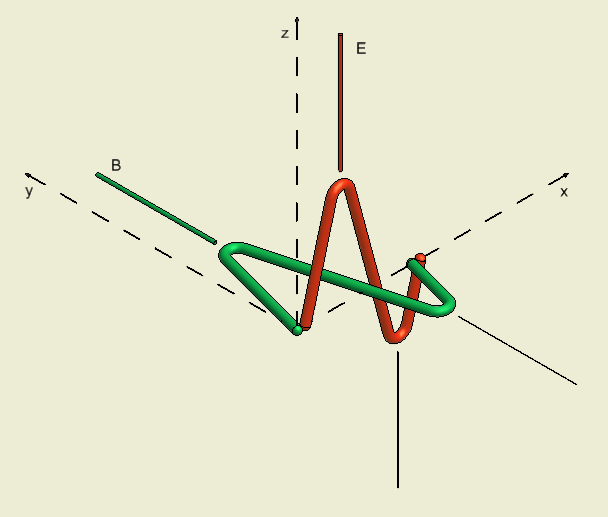 As a result of its disintegration in the process of the creation of pairs, the vertical quantum (red) producing the line E will become an electron, while the horizontal quantum (green) producing the line B will become a positron. 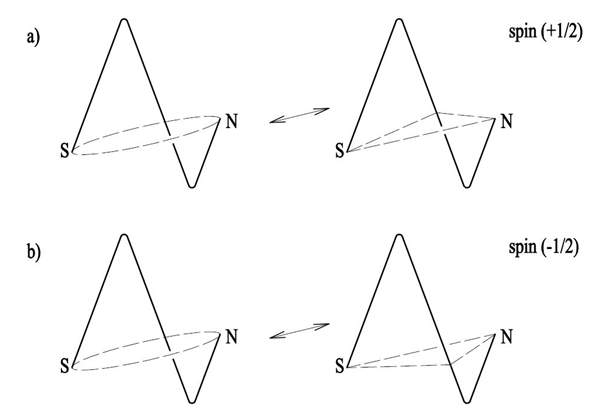 The transition from a quantum of energy to electron is shown in Figure 2. As it is apparent from the above, an electron is an elementary magnetic dipole formed from magnetic monopoles. In the macroworld, an electron as a magnetic dipole is an equivalent to an asymmetrical horseshoe magnet, except that, being elementary, it cannot be divided. 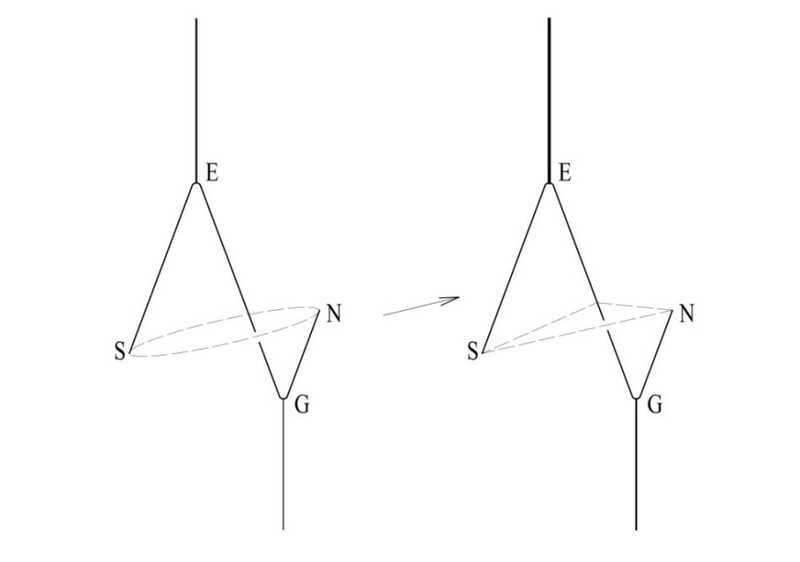 The transformation of a quantum of energy into an electron presented in figure 2 can occur in two ways (see Figure 3). If it gets deformed in one direction, its magnetic field lines will arrange as shown in Figure 3a. If it gets deformed in the other direction, its magnetic field lines will arrange differently, as shown in Figure 3b. It is easy to notice that the electrons shown in Figures 3a and 3b are mirror images. This means that two identically formed electrons may have differently arranged in space magnetic field lines (they may be spacially quantized); that is they may arrange differently (in two ways) in the external magnetic field. As mentioned above, in the physics of elementary particles, such a phenomenon is known under a false name of a spin. During the process shown in Figure 3, in addition to the spin feature, an electron originated from a quantum of energy gains other elementary features known and unknown in the modern physics. – It becomes a carrier of an elementary magnetic dipole which is represented in Figure 2 by the poles N and S.
– It becomes a carrier of an elementary charge which is represented in Figure 2 by the line E. This means that at the same time an electron is a carrier of elementary charges of two fields, electric and magnetic. The lines of these fields are perpendicular. – It becomes an asymmetrical “elementary horseshoe magnet”. It is no longer a symmetrical “elementary bar magnet”. The asymmetrical structure of an electron causes that its position is unsettled during movement in space. – The asymmetrical structure and unsettled position in movement cause that an electron is subject to resistance to motion while moving in quantum gas. – The asymmetrical structure also causes that an electron becomes a three-dimensional form. In addition to the length and width, it has also a third dimension which may be named the height or depth. As a result of this process, an electron becomes an elementary particle of mass. – It follows from the above that an electron as a mass particle moving in the world of quanta (in quantum gas) is subject to resistance to motion. – Electrons and the same amount of positrons are components of the whole mass of the Universe. – An electron, when compared to the quantum of energy it has originated from, has lost its ability to extend or contract; it has lost its ability to change the stress, vibrations with different frequencies, that is in a macro scale it is no longer a determinant of temperature. – An electron has been “precipitated” from the world of quanta, just like deposit from a solution. Its shape has been “frozen”. It is vibrating with a constant, defined frequency, probably this is the frequency of the quantum it has originated from (1020 Hz) or higher. – Since an electron has fallen out from the world of quanta, its driving force is no longer dark energy; its driving force is now energy quanta. – Since an electron is in motion under the influence of energy quanta, it can move with variable speed lower than c.